The punchy pop rock of the current 'Stars, Guitars & Megaphone Dreams' by Yancy is only the latest achievement for a singer who in her 12 years of Christian music ministry has covered more bases than most artists manage in their entire careers. 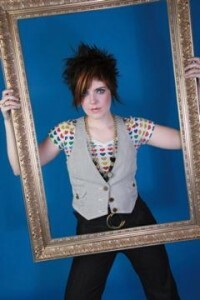 As well as her latest metamorphosis as a Pink-styled rock chick, this most versatile of singer/songwriters has been a teen pop performer, a children's minister, a praise and worship leader, a successful author and has still found time to write hits for other Christian artists like Avalon and Jaci Velasquez. Now Yancy is a mother as well, having given birth to the wonderfully named Sparrow Rocket Richmond on 25th February 2011. Motherhood will not stop Yancy Richmond's drive to minister the Gospel. Said Yancy, "The baby is coming on the road. I grew up a preacher's kid and was always very involved in what my dad was doing at church. We plan to raise Sparrow the same way, allowing him to be very involved in what I do." Yancy's father is in fact Jim Wideman, a pioneering children's youth ministry man and author of such books as Connect With Your Kids and Turning Your Kids' Failures Into Success. Looking back over her childhood Yancy enthused, "I've grown up in ministry. I came to know Christ when I was seven years old. I've always been going for it whole-heartedly. I never reached one of those points in my teen years where I was being pulled away or trying out other things. One of the biggest reasons for that is because I've known what I want to do - music - for a really long time. I did my first concert when I was 15 for my youth group at church. Some of that really helped me to stay focused and committed in my faith. I had a lot of great people - whether it was my dad, a youth pastor or music director - who invested in me. They believed in me. They believed I had something that I wanted to do and that I had potential. Their encouragement, as well as their guidance, to get in my face and tell me, 'You shouldn't be doing this' and, 'You should do this', has made me who I am today. I'm really grateful that I had people who were willing to step in there, coach me and disciple me - both on-stage and off. "My piano teacher, growing up, a guy named Willie Davis, was actually Carman's music director back in his heyday. In one of my piano lessons when I was 10 years old, he spent the whole time - all 30 minutes of it - telling me about how I shouldn't get a big head and get stuck up, and that there would be many times in life that I would be put in situations where I might be better than the person who's twice my age but I don't need to act like it and I need to treat those people with respect. To get in there and do my thing, but not be a jerk about it." Yancy's family were originally from Mississippi where she was born. She grew up in Tulsa, Oklahoma and by her late teens was performing regularly at coffee houses, churches, youth groups and conferences across the country. In 1999 Yancy won the Gospel Music Association's International Spotlight Competition. The following year she released her debut album 'Big Weather Change' which one reviewer described thus, "Producer and drum/percussion/drum loop programmer Jeff Quimby underscores Yancy's hooky melodies with some contemporary hip-hop grooves, and complements her spirited vocals with radio-friendly acoustic-electric layers." But it was as a songwriter for others that Yancy was to enjoy her biggest successes. Her song "I Don't Want To Go" from the Grammy nominated 'Oxygen' album by Avalon made number one in the US Christian charts while songs like "Something Beautiful" from Jaci Velasquez's 'Beauty Has Grace' album were also popular. Independent albums like 2001's '6.5 Stories' and 2002's 'Adeline Street' followed. But things were changing for Yancy. "I started off doing more traditional CCM-type of music performing at a lot of youth groups, festivals and ministry events, but then I got involved in leading worship in a local church setting. I've often joked I've led worship with every age from birth to death, but through that, I gained tons of experience and knowledge. In the mid-2000s, I was writing a theme song for an elementary camp programme once a summer, and after doing that for several years, I thought I could write a few more songs and release a kids' record, which wasn't a career move at all, but just something that came really naturally. Out of that, I started touring around doing a lot of events for pre-teens and it was obvious God wanted me to go in that direction because tons of doors kept opening." Yancy's first worship album, 2004's 'Beautiful Sound' was followed by popular children's projects 'Little Praise Party: My Best Friend' (2008) and 'Rock-N-Happy Heart' (2008) aimed at pre-teens. Remembered Yancy, "As I was doing the record, I was trying to find something to indicate that it's rock and fun. I wanted it to be something that speaks happiness and joy. I had come up with a few different ideas. I e-mailed them out to some friends. Every e-mail I got back was a different response that I didn't necessarily agree with. I ended up having a conversation with a couple of pre-teen students who were in the studio recording some vocals with me. Somewhere, in the course of our conversation, 'Rock-N-Happy Heart' came out of that. It was perfect! It totally said both the things I wanted to say, but in a more creative way than what I was going with before. I have to attribute it to my little friends' help. Overall, the album has a rock meets pop sound. There are a few worship songs on the record too that are more piano-based." As well as the 'Rock-N-Happy Heart' album and the remix version of the project released in 2009 there is also a Rock-N-Happy Heart devotional book. Said Yancy, "There were 12 songs on the CD and I dug into each of those songs for a week and wrote a daily devotional, with some Scriptures and questions for the reader to ask and dialogue with themselves about how that topic impacted them." In 2009 Yancy once again demonstrated her phenomenal versatility by releasing a Christmas album. Apart from a wince-inducing title 'Have A Fancy Yancy Christmas' it had credible reworkings of evergreens like "The First Noel" and "Joy To The World" deftly produced by Steve Leiweke (Chris Sligh, Cindy Morgan) as well as Yancy-penned originals "Merry Christmas, Happy Christmas" and "Christmastime". It was relocating to Nashville that has finally given Yancy's music the kind of profile and distribution it deserves. 'Stars, Guitars & Megaphone Dreams' has been succinctly described by publicist Brian Mayes as "a sonic melting pot that manages to mirror the likes of Nordeman to Superchick to Pink to Brooke Fraser to Avril Lavigne all in one contagious, Yancy-stamped package." Said Yancy about her latest album, "There's a family-friendly type vibe to the record with parts that are really fun and exciting and parts that are full of worship for anybody of any age to latch onto, assuming that they latch onto what I do in the first place. I'm not making a normal CCM record and worrying about fitting in, or on the flipside, trying to be cooler than the next guy. If a guitar part makes me smile, then I'm keeping it in even it's its silly or light-hearted. I try not to over analyze the way I make music and people can take it or leave it. I make music from my heart and that brings me joy, and in the process I've found the listener connects to that authenticity." One of the album's standout tracks is a delicious cover of Fleetwood Mac's "Don't Stop" while another is Yancy's composition "God's For Me". Commented this most versatile of songsmiths, "It was written from a personal experience about putting our confidence and future in God's hands and knowing he'll take care of us and work it all for our good. I'm really thankful for the promises in God's word in how we can hold fast to those things, whether we're in the valley or the mountaintop, because God is on our side!"